This cake makes a great dessert or birthday cake to serve a crowd. It can be made a few days ahead and is always popular. The coffee and halva flavours might be a bit sophisticated for small children, although our two and a half year old granddaughter Natalia loves olives, artichokes, radicchio and rocket, so you can never tell. The recipe is adaptable – instead of coffee you could add chocolate chips and instead of halva you could add crumbled honeycomb or violet crumble bars. Use your imagination. Halva is a dense, crumbly Middle Eastern sweet containing nuts – a bit like a cross between fudge and nougat. The chocolate sauce uses ingredients everyone has in the pantry (so you don’t need to rush out and buy a bar of chocolate) and keeps for at least a week in the fridge. If preferred you can make a sauce by heating a cup of cream to boiling point, then removing from the heat and adding about 200g chocolate (milk or dark), broken into squares. Stir till dissolved. Meringues: Line two baking sheets with baking paper and turn oven to 150°C. Draw a 20 cm diameter circle on each sheet of paper. With an electric mixer whip egg whites with salt until they hold their shape, then gradually add the sugar, beating constantly, until you have a thick glossy meringue. Spread meringue evenly onto the circles you have drawn, leaving a little space all around as they will expand in the oven and you want them to fit into a 20 cm tin. If liked, sprinkle almonds over one then bake the meringues for about an hour until firm but pale in colour. Turn off the oven and leave them to cool in there. Coffee Ice Cream: Remove ice cream from the freezer and let it soften for about 10 minutes then tip into a large bowl and stir until smooth. Thoroughly mix in coffee mixture, then put back into container and refreeze. Halva Ice Cream: Mix sour cream with icing sugar, vanilla essence and roughly crumbled halva. Tip into a plastic container with a lid and freeze. Remove the two ice creams from the freezer about 10 minutes before assembling the cake. Place the meringue layer without the nuts in the bottom of a 20 cm springform cake pan, bottom-lined with baking paper. If too big, carefully trim off the edges with a sharp knife and keep testing, till it goes in. Spread a layer of coffee ice cream over the meringue. 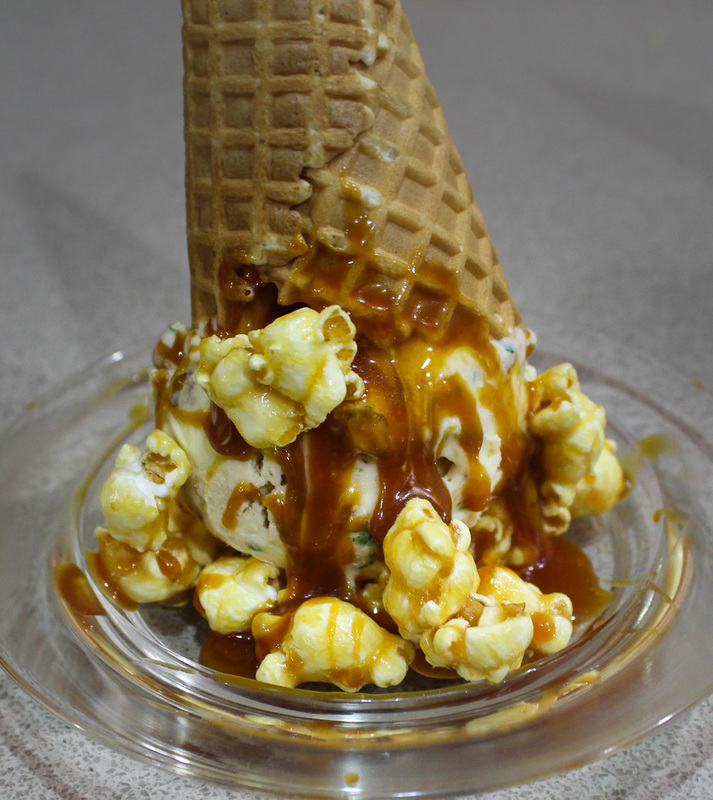 There will be more of this ice cream than the halva one, so you may decide not to use it all. Sprinkle the meringue trimmings over the ice cream – unless you’ve already eaten them – then spread evenly with the halva ice cream. Top with the other meringue, nut side up and trimmed to fit. Press down gently. Cover with plastic wrap and place in the freezer for up to 3-4 days. Remove from freezer about 15 minutes before serving so it’s not rock hard. Run a knife dipped in boiling water around the outside of the cake to enable you to remove sides from cake tin. Dust top of cake with cocoa powder through a sieve. Slice cake with a knife dipped in boiling water and serve with the sauce. Sauce: Choose a large pan because this recipe will boil over if the pan is too small. Place all ingredients except butter, vanilla essence and cream in pan. Mix then simmer for 5 mins without stirring. Cool for 10 mins then stir in butter and vanilla. When almost cold mix in the cream. Serve warm with ice cream. Keeps for at least a week in the fridge – reheat in the microwave and allow to cool a bit. If piping hot it will be too runny. 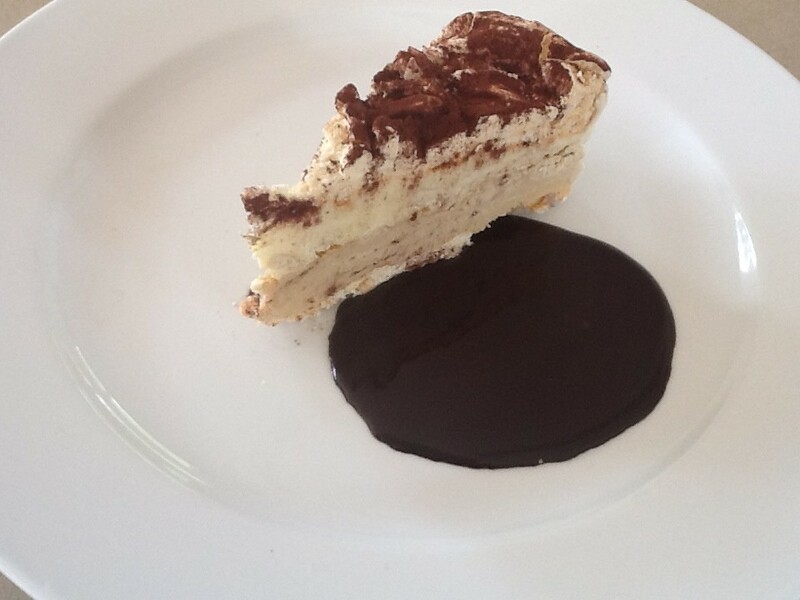 Variation: if preferred divide meringue into three to make three thinner layers. This allows you to put one between the two flavours of ice cream. Raspberry Cake with Raspberry Coulis: leave the first layer of ice cream plain vanilla, leaving out the coffee. For the second layer place the two packets of sour cream in food processor with 2 cups frozen raspberries, 300ml cream and icing sugar to taste. Blitz enough to combine but leaving the raspberries a bit chunky. Serve cake with Raspberry Coulis instead of Chocolate Sauce. Salted Caramel Ice Cream Cake with Hot Chocolate Sauce: Instead of slivered almonds on one meringue layer, use skinned and lightly toasted hazelnuts, roughly chopped. Instead of the coffee and halva ice cream layers, use three 470ml tubs of Connoisseur Murray River Salted Caramel Ice Cream with Chocolate Coated Hazelnuts. Remove from the freezer to soften slightly then mix them in a bowl then spread over the first meringue layer. 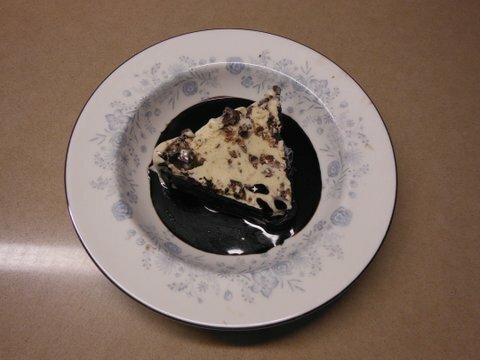 This entry was posted in Recipes and tagged cake, chocolate, dessert, ice cream, summer by Linda Peek. Bookmark the permalink. yummmm, I’ll think of this recipe when I have the patience to go through all the steps, meanwhile I’ll drool at the sound of it. Your lucky family Linda, to get to share this cake! Gosh, Linda, this sounds fabulous! I’ve decided cake-baking is my new winter hobby so shall try this out. Can’t get halva in la france profonde – will have to wait until I can bring some back from UK. A crumbled up honeycomb bar or two could replace the halva. I’m going to make this for our Christmas drinks on 22/12/12… I have some halva which I don’t know what to do with and it will be nice if it is hot.